Okay, no, no. I’m not getting super forgetful or anything, I just thought that it seemed funny (kinda) and totally appropriate for today’s review. What am I reviewing, you ask???? 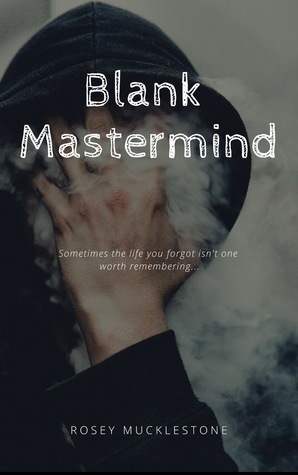 Rosey Mucklestone’s newest book, Blank Mastermind. I’m gonna give you the synopsis real quick (from GR), because it is just that good. This book is probably one of my favorite books that I’ve read all year (and I’ve read a lot of amazing books, believe me). Why, you ask? Lemme tell you. The humor is to die for. I’ve read many books where the author tries to make the narration or their main character funny … a lot of times leading to it feeling forced. Yeah, um, not with this book! It is funny, but it feels very natural. And when I say funny, I mean funny. But I do have to say, my favorite thing about BM (and no, it’s not Wolf *sigh*) is how it’s so believable. How Wolfy and his character arc develops is just fabulous. Backstories are A+. Everything just feels very … real. Wolf is a beaut. We start out with him being an amnesiac, so a whole lot of his personality is unsure … but boy is he sarcastic and funny. As we – along with Wolf – figure out just who he is, his character develops believably. He is hilarious and kinda clueless for almost all of it. I’ll admit, I’m kinda on the edge with Dallas. On one hand, his is the sweetest, most innocent, most clueless (er, after Wolfy) character ever and WE MOST PROTECT HIM AT ALL COSTS. I really liked him … but yet on the other I felt that he was one of the least developed characters, which is kinda sad because I would have LOVED to see more of him. Bad News is another beauty. He seems straight out of a mobster family. He’s all big and tough … BUT he listens to kids music and eats ice cream 24/7. He’s sweet and can see straight into a person’s soul. While at first I thought that I would hate that combo, I discovered that I absolutely loved it! Very unique and written well. As I’ve already gushed over numerous times, the writing was to die for. We start out in the beginning where we and Wolfy know next to nothing. It is very light and almost goofy in the beginning, having me manically giggling every-other page. And yet, as the story progressed and the tone got a little heavier, it grew more serious very slowly. At the end, then, when things began to resolve, it got funnier again. Everything just progressed so … perfectly. The tone was absolutely amazing. And, I mean, guys. I love Rosey’s writing!!! It was just perfect. Fit the story super well. There were a few lines of Christian themes in there – prayers and stuff. Now, that’s whatever. But I felt that whenever it was in, it felt very out of place, imo. A lil disjointed. Also, the resolution was a little quick/neat, but otherwise I think that that’s it! Blank Mastermind has something for everyone. You like superheroes? Ya, it’s covered. Humor? For sure. Sweet contemporaries? Action? Redemption? Villains and tragedies? IT HAS IT ALL. Very funny and fun, Wolfy is the best character ever. The writing is fab. Everyone should read it. There is some violence, but overall, not too much. There is muuuurder, but we don’t actively see it. Lots of sad sequences (NO, I’M NOT STILL CRYING 😭 ). Okay. If you are not down right excited, then I’ve obviously done something wrong. This book is amaaaazing!!! Also, go stalk Rosey on her blog, IG, Pinterest, and Goodreads. Now let’s chat! Fav unique book? Leather-clad villain/hero?? I’d love to know! How did i not know about this? It sounds awesome! Villainous main character and all! The gifs totally made it, I loved them so much. xD I’ve been drawing a lot of inspiration from Agents lately, so it made me very happy. Also yeah that was something I tweaked a little bit right before getting into the final version was Dallas? I didn’t have him pegged down as much in Blank Mastermind. I more got his voice in some short stories afterwards and had him down for the sequel thing a little better.